We can work with groups to create collaborative projects—for events, schools, fundraisers, etc. You can provide the origami pieces (like this 1,000-crane project for a sick first grader) or we can work with you in workshops to create custom origami designs and installations for your school, arts organization, museum, church, company, city, youth group or community center. During the 2012 Big Rapids Festival of the Arts, nationally acclaimed artist Linda Stephen presented workshops on origami, the Japanese art of paper folding, in order to create a collaborative origami collage landscape celebrating the city and people of Big Rapids, Michigan. In two days, more than 400 city residents, ages 3 to 90, came together and created 2,000 tiny origami tulip tops from half-inch squares of paper in 20+ different hues. Origami workshop video. Then, in the year that followed, Linda Stephen incorporated the community-made origami pieces along with her own original origami sculptures to create the rich mosaic christened “Big Rapids: Enfolded by Beauty.” The finished artwork of a downtown city park is about 2 feet high by 3 feet wide. Time lapse video. DESIGN CHALLENGE: It is said that if one folds 1,000 paper origami cranes, one’s wish will come true. In “Cranes Dancing in the River of Life” origami art landscape, the family sent us more than 1,200 origami paper cranes made by first graders and adults—classmates, family and friends—who had read One Thousand Cranes: The Story of Sadako and were hoping for the health of a child with leukemia. The boxes were filled with more than 200 papers including origami paper, gold foil origami, white office paper and blue construction paper. In honor of the girl’s return to health, the family wanted to create a joyful scene that would represent nature, peace in the world, and love of friends and family. RESULT: We designed “Cranes in the River of Life” to honor the love of classmates, family, friends and community shared with a sick child. We started with the crane, the Asian symbol of long life and peace. In Japan, the “tsuru” is a large bird about 5 feet tall that lives more than 50 years and mates for life. 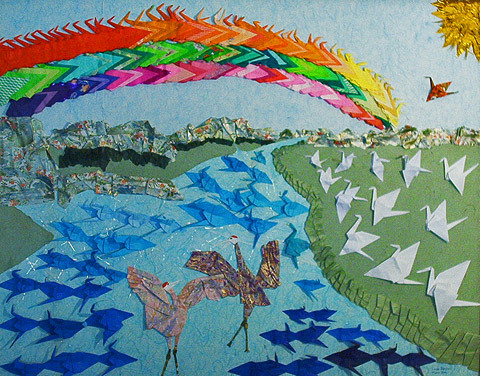 This collaborative piece (32″ X 40″ unframed) incorporates the paper origami cranes throughout the landscape—waves in the river, colors in the rainbow and the golden sun, and cranes flying toward the river. We used hundreds of cranes representing the breadth of the contributors and their abilities—including imperfect cranes with hand-written notes from first-grade classmates. The two dancing cranes in the middle of the scene are Masaya Honda’s invented origami shapes that honor the Japanese crane, symbol of health, peace and long life. If you are in the San Diego area, you may see “Cranes Dancing in the River of Life” in a local elementary school or children’s hospital.